Go ahead and sit while I fix you a drink. What'll it be? Some prefer a mixed cocktail to unwind and loosen their tongues. I think you'll agree that a beautiful fountain pen in hand is as enjoyable to hold and is capable of the same effect. 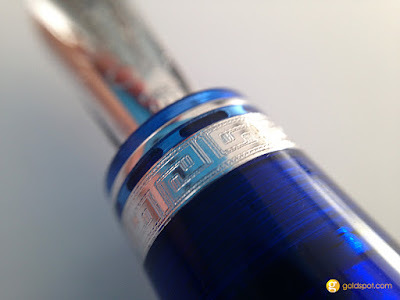 In particular, the 2015 limited edition from OMAS is intoxicating and absolutely irresistible for fountain pen writing enthusiasts. The Ogiva Cocktail is the sequel to the 2014 Ogiva Alba limited edition demonstrators. If their popularity is any indicator of how quickly these pens will be imbibed by collectors, you better belly up to the bar quick before it's "last call." Limited to 327 pieces of each color, the Ogiva Cocktail is available in three colors : Blue Angel, Vodka Lemon (yellow) and Bloody Mary (deep red). The Ogiva model has a rounded profile and flutes that run down the cap and barrel. The classic appeal of the profile is matched with silver trims and a cap band that has engraved Greek key work. The translucent cotton resin on the Cocktail is stated by OMAS to be more durable than standard acrylic resins. The bright yellow of the Vodka Lemon is cheery and, by far, the most transparent of the three. The rich, blood red of the Bloody Mary is trumped by the cobalt blue of the Blue Angel for the most opaque material. 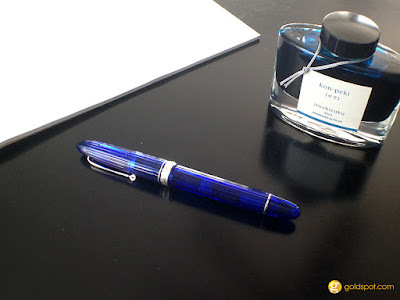 From a fountain pen geek point-of-view, there's a lot to love about this pen. The heart of the argument is the nib. Most pen manufacturers are sizing down their inventory of nib variations, with most only offering fine and/or medium in their fountain pens. 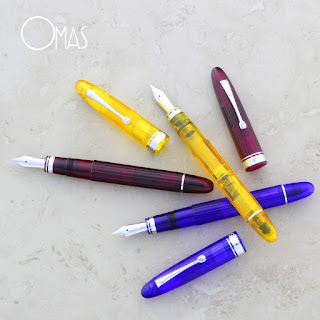 OMAS is going in the opposite direction and is offering this limited edition in a whopping 9 nib types : double broad, broad, medium, fine, extra-fine, stub (18kt) / extra-flessible extra-fine, extra-flessible fine, and extra-flessible medium (14kt). 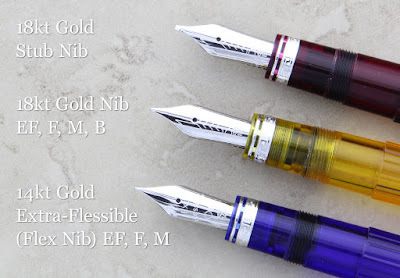 The 18kt gold set of writing nibs are non-flexible and offer a high-quality writing nib for general purpose use. The stub 18kt gold nib offers a great deal of line variation with thick vertical strokes and thin horizontal lines. The extra-flessible 14kt nibs are a whole other experience that is to be savored for those who appreciate writing with a flex nib. The extra-flessible can be written with like a standard extra-fine, fine or medium writing nib. Once you flex the tines by applying gentle finger pressure at the right angle on a downstroke, the tines spread to paint ink on the paper like a brush. Much like the Pilot / Namiki Falcon, the OMAS extra-flessible is your go-to for contemporary flex nib writing quality. The Ogiva has an internal piston mechanism that drinks in the ink much more than your standard cartridge or converter. Being able to see through the tinted, cotton resin, a writer can see exactly how much ink is left sloshing around inside the barrel. Grabbing a drink of Kon-Peki, the OMAS Ogiva Cocktail Blue Angel gets taken for a spin around some paper to get a feel for how this pen writes. The pen posts rather long, at over 6 1/2 inches in total length. It is a shallow post, so I was concerned the cap is connecting directly on the blind cap that operates the piston. Thankfully, it doesn't, and I was able to post & un-post the cap without moving the piston (and getting ink all over the place). The pen does not feel too long with the cap posted. Due to the lighter weight of the cotton resin, the pen is comfortable to write with for long periods of time. The section steps down twice from the fluted barrel. There isn't much of a lip between step from barrel to section and screw threads to front nib section. 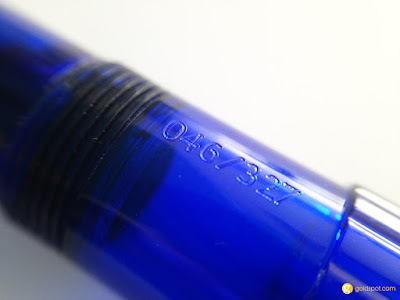 The section between the threads and the barrel is where the limited edition number is engraved. This area is particularly useful to grip if you are writing in "flex mode" and need to hold the pen at an angle more acutely to the paper. The same Greek key design on the cap band wraps around the end of the section and is a classy accent to the overall design. Writing with the extra-fine, extra-flessible 14kt nib, I immediately went to testing out the flex. I routinely write with vintage flex nibs and can tell you that the OMAS extra-flessible is the real deal. 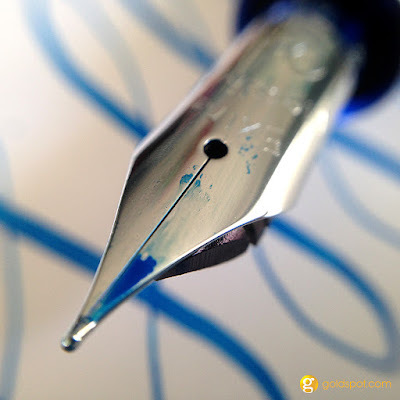 With no pressure, the nib writes a delicate extra fine. With flex, the tines spread out to provide a thick, double-broad line. Easing up on the pen returns the tines back to their original position smoothly and quickly. Take a look at the writing samples and the video to get a sense for how well this nib performs in providing flourish and high degree of line variation. Writing with this pen is an absolute pleasure. The size is just right to either write posted or with cap-in-hand. 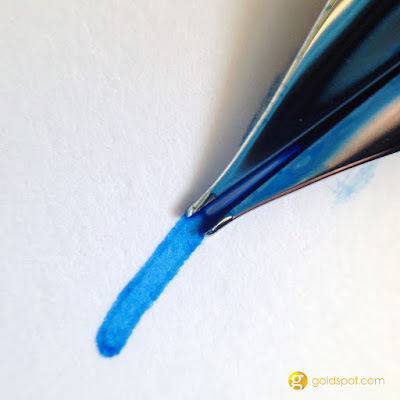 The flex on this "flessible" nib is a writer's inky dream. I like to take detailed notes, and being able to write with a standard, extra-fine writing nib is perfect for quick jotting. When I'm writing thank you notes or signing consignment forms, then I can bust out the big, bad flex to really let this nib do what it was made to do. 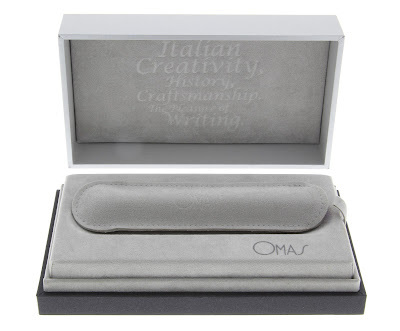 OMAS kindly provided us with a 90th anniversary 5" x 7" journal for us to do with as we please, so we're giving it away in celebration of this mighty fine writing instrument! Use the form below to enter. You have until Tuesday, October 20th at 2pm Eastern time to enter. Be sure to tell your friends! If you ask me which pens I'm going to be writing with for the next few months, this OMAS will most likely be on the top of my everyday carry. With the vintage-style, flexible nib, large ink capacity and classic style, this is a pen that I can't stop looking at, let alone put away in my pen case. Be sure to get your OMAS Ogiva Cocktail pen before supplies run dry!